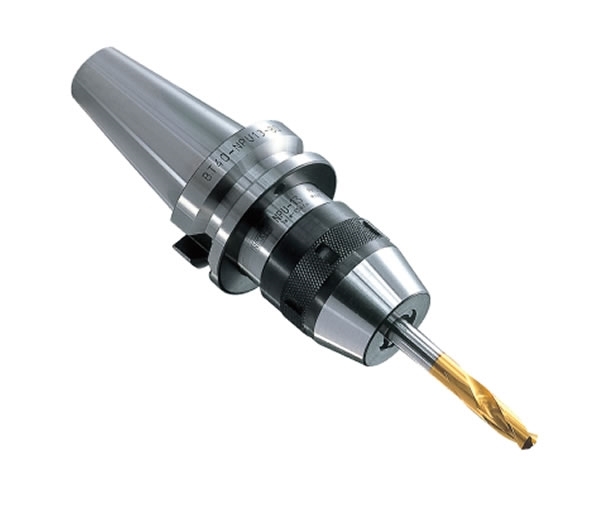 Nikken's NC Drill Chuck offers 'solid' performance when compared to similar competitor systems. The NC drill chuck is a compact, precise, rigid and most of all safe solution for a wide variety of demanding applications. Competitor systems adopting the 'Jacobs' style interface in their design are unreliable and not particularly ideal for unmanned nor precision applications. The 'Jacobs' system features only a taper for the location of the drill chuck and for higher speed or heavy duty applications can detach from the base holder. The NC drill chuck incorporates an internal captive design or 'solidifying' bolt system which 'in effect' allows the base holder and drill chuck to precisely become one. This internal design allows the assembly to be considerably shorter and when combined with the compact head the system proves incredibly versatile. We currently offer two sizes for the NC drill chuck; NPU8 (0.3mm to 8mm diameter) and NPU13 (1mm to 13mm diameter). Available as standard on Nikken 2-Lock for both BT and DIN tapers the NC Drill chuck also offers the benefits of dual contact for both flange and taper on suitable machine tools (2-Lock is also fully compatible with standard BT/DIN type spindles). 2-Lock increases the contact area considerably from around 44.4mm to 63mm (BT40) and also, as with all our NC tooling products, provides users with over 80% taper contact as standard. Additional standard options of course also include HSK and Nikken Polygon tapers.